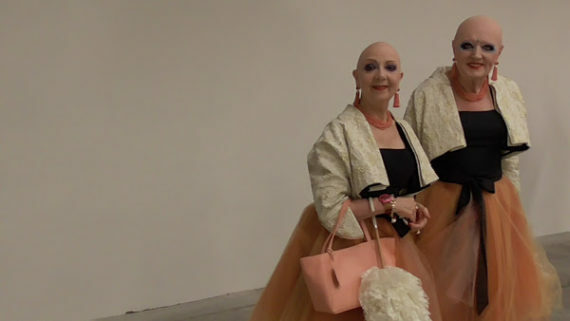 57th Venice Biennale from the perspective of Margherita Gramegna, founder of 51zero, international moving image and digital arts festival in Medway, Kent. I set off to explore this year’s Venice Biennale with one objective in mind and a hope. First, to see as much as possible in order to inform my research for the bespoke International festival of artists’ moving image and digital art that 51zero produces in the South East England, Rochester and Kent (51zero.org). Second, I hoped to be inspired. For the second part of my research, my plan was to wander through the exhibition as a general visitor to locate specific strategies that the biennale planner put in place to enrich the visitor’s experience. 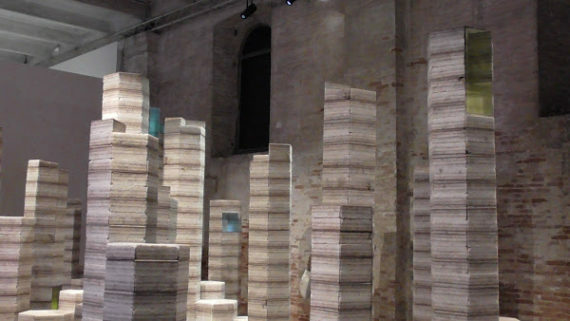 The Venice Biennale is now one of the main forums of World art, as such, it is specifically differentiated from other large scale events, therefore visitors’ expectations are high. Spread across the Giardini and Arsenale and unfolding over nine ‘chapters’ or trans-pavilions, each with a theme, like chapters in a book, the exhibition continues throughout the town including other national pavilions beside those within the main sites, collateral events still part of the Biennale, as well as a number of parallel and ‘fringe’ events and showcases dotted around palazzi and alternative spaces. The sheer vastness of the exhibition proved equally exciting and challenging to approach. I was positively enthused by the vision of Paolo Baratta, Venice Biennale’s President, for the Biennale to be “a place whose method – and almost raison d’être – is dedicated to an open dialogue between artists, and between artists and the public”. It almost felt like a ‘friendlier’ Biennale. However, that and the event’s description “a Biennale designed with artists, by artists and for artists”, left me slightly perplexed from the outset. Particularly in relation to the kerfuffle over the admission myself and some colleagues went through to gain access. For once, you would expect a Biennale ‘for artists’ and ‘the public’ to be less selective, certainly not ‘elitist’ when admitting other visiting artists. Remaining focussed and undaunted by this initial setback, I took as my mantra the caption at the entrance of the Central Pavilion at Giardini, defining the exhibition premise. The caption’s core message examines the importance of alternating ‘otium’ and ‘negotium’ in artists’ practices and in the way artists create art, quite ironically punctuated, in my opinion, by the photographs by Mladen Stilinović, Artist at work, 1978, and Artist at work – Again, 2011. Alternating my time viewing, documenting, and collecting information with meeting people, discussing and enjoying local food, I approached the Biennale in a similar way to the creative process involved in the making of a work of art, sometimes more successfully than others, with this research in mind as the outcome. At first sight, the title of the 57th Biennale Viva Arte Viva appears to repeat itself, but it is in-fact conceived as a celebration of artists – Viva – and of art as being alive – Arte Viva. Also, it fittingly translates as ’live’, that is, in real time, since it presents live performances and live-stream feeds by the biennale’s Mediacenter. 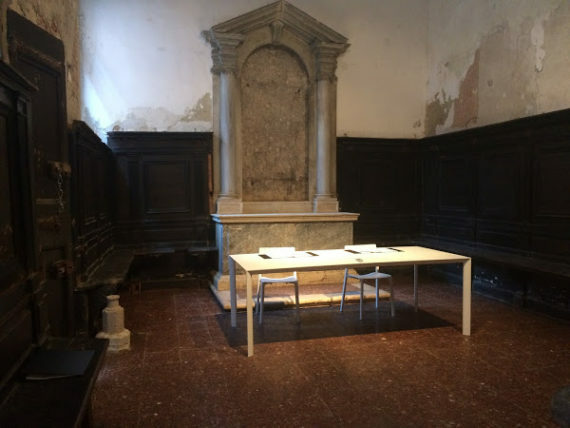 As I entered the first chapter, Artists and Books, at the Giardini Central Pavilion, I was confronted by the energised punk-ish performance The Sun, The Moon, and The Stars, 2017 by Dawn Kasper’s mixed media installation, and as I exited the pavilion, through the chapter of Joys and Fears, several hours later, I encountered a Tavola Aperta – Open Table, with American artist Kiki Smith. During the six months of the Biennale, every week different artists host an Open Table and meet visitors over a casual lunch to hold a conversation about their practice. I was quite interested in this format, but I was left unsure on the premises and the democracy of the selection process defining how and who is invited to sit at the table. Does it work as in the Italian song Aggiungi un posto a tavola, which implies that anyone can sit at the table, all you have to do is to move your chair a bit? Probably not. Still, I felt it had a lot of potential. Despite the overall curatorial set-up and subdivisions, while navigating the exhibition I let those parameters go past me as the links between chapters and the work was at time loose, overlapping or not always apparent. Which possibly worked in its favour giving the exhibition a more homogeneous feel rather than that of a divided structure. Thus I concentrated first on those pieces that for whatever reason captured my attention. Including quirky visitors and profound homemade advertisement. Although fun seems to be a dirty word in contemporary art, I always look for something that makes me smile. Without a doubt, serious matter deserves a serious response; however, humour, as we know, can be an equally strong, if not superior at times, communication tool. In the Artists and Book chapter, I came across John Waters series Study Art Signs, 2007. 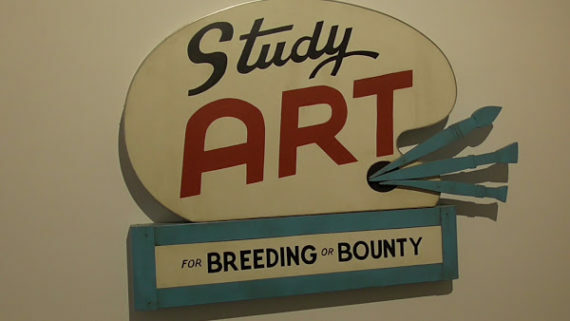 The vintage looking signs invites viewers to study art ‘for Fun or Fame’, ‘for Prestige or Spite’, ‘for Profit or Hobby’, ‘for Pride or Power’ or ‘for Breeding and for Bounty’, based on original advertisement slogans from the Baltimore School of Fine Arts. Fun or humour are not often associated with conceptual art, so it was with anticipation that I wandered through rooms hoping to find yet a new sign. And to find more amusing art. I did find some, a lot more subtle, in the Pavilion of Earth, in Arsenale, where I encountered Inuit artist Kananginak Pootoogook. 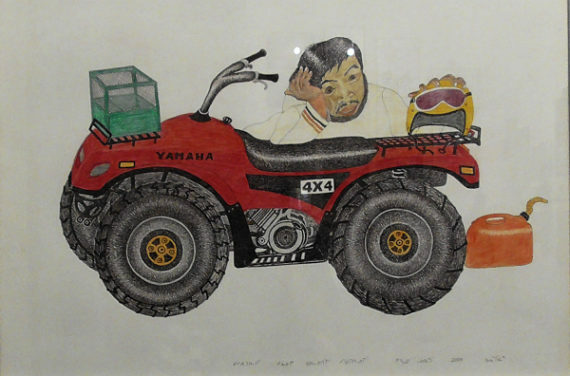 I am not into naive art, but it was quite refreshing to see pencil drawings so seemingly innocent, with titles that remind me of that ‘matter of fact’ way of children, which can be quite comical, such as He thinks he has run out of gas, but the engine is shot, 2009. Having said that, some of Pootoogook other work is far from humorous. His skilled drawings in-fact also addresses concerns about traditions of his people afflicted by modernism, bringing awareness of Arctic indigenous culture. Untitled (RCMP and Inuit Family), 2007, for example, depicts a tense dispute between an Inuit family and a Canadian law officer. 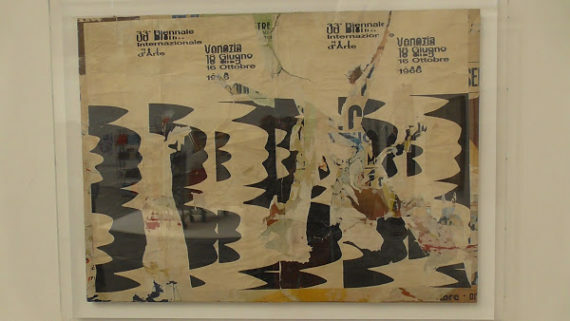 Among the National exhibitions at Giardini, the Romanian Pavilion exhibited seminal work by Rumanian artist Geta Bratescu. “The humour and pleasure of the act of drawing are immediately apparent”, the pamphlet says. 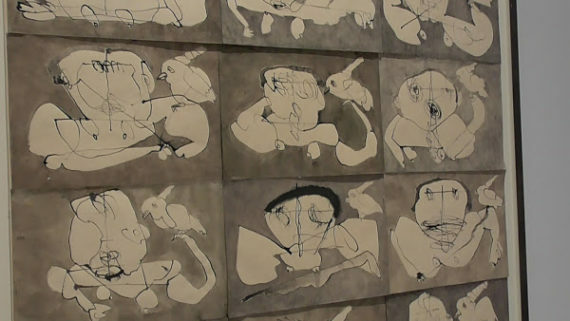 Her Myself and the Bird Bird, 1993, and Apparitions series are indeed produced using a curious process: the sets of improvised drawing defined as “mental apparitions” were created with her eyes closed, through the drawing “the artist’s hand seeks to convey her preoccupation with interiority and self-contemplation”. To continue on the subject of processes, meeting Raymond Hains’s posters of past Biennials, was for me like ‘coming home’ as, despite not knowing who Hains was, I am very familiar with his technique.This highly regarded French artist of the late nineteen hundred, Hains is recognised for his affiches lacérées, using torn posters he finds along the streets to create hypergraphics. Later, in the digital era, he progressed with new forms such as Macintoshages, computer-based manipulations from the 90’s, when lettering transformation was made easier by digital tools. In the Pavilion of Artists and Books, I actually encountered what became one of my special pieces. As an artist filmmaker, my attention is monopolised by moving images and Taus Makhacheva’s Tightrope, 2017, truly captured my imagination. 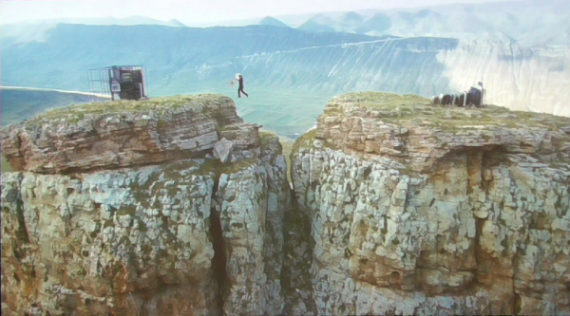 I relished in creating my own meanings from the scenario presented in the film, where Rasul Abakarov, successor of a prominent Dagestani dynasty of tightrope walkers, transfers colour reproductions of artworks from the Dagestan Museum of Fine Arts’s collection, between two mountains. 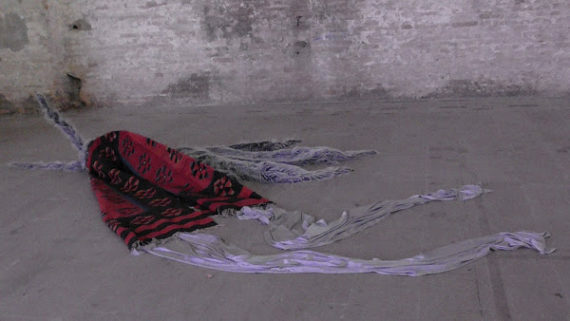 Beautifully shot, the piece comments on invisible heritage and museums, storing work that is never exhibited. It is also metaphorical of the artist’s daily fears and struggle and could be read as a vaguely sardonic response to the Biennial curator Catherine Macel’s call to celebrate artists and their ways of life, visually translating the uncertainties artists encounter in creating work, the precarity and the strain of balancing practice with duties and obligations. The tension and fear of falling pervading Tightrope completely evaporates in Suspension, 2014, a hypnotic film by Sebastián Díaz Morales in the Pavilion of Joys and Fears, where a man falls through space. Here the sense of falling into emptiness is represented as “existential metaphor” and strikingly rendered via extreme slow motion as in a dream. 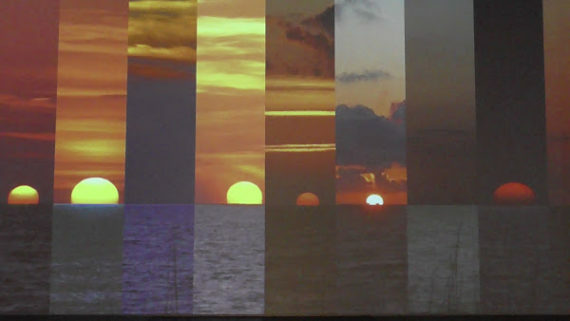 The never ending image suspended in time envelops you and transports you with it, in a, for all we know, possibly eternal fall. An equally absorbing piece is the imposing five-channel video installation by Charles Atlas at Arsenale. He received a special mention for his work The Tyranny of Consciousness, 2017 showing Kiss the Day Goodbye, a montage of 44 sunsets, Chai, a video of a digital countdown ticking off the time taken by the sun to set down and Here she is…v1, an audio lecture addressing issues of “sexuality, class, austerity and frustration” by the notorious Lady Bunny, a drag queen from New York. Impressed by the editing technique and beauty of images, I could have easily sat watching these sunsets for hours. The installation is a real visual treat and unquestionably stands out, commanding the space at the entrance of the Pavilion of the Earth. As it happens, it is in this pavilion where I saw most of my favourite pieces. Sculpture features quite extensively in and out of the main pavilions; the monumental sculpture by Julian Charrière’s Future Fossil Spaces, 2017, is made of salt from Bolivia’s Salar de Uyuni, the world’s largest salt flat and lithium brine enclosed in colourful acrylic containers looking like precious gems. 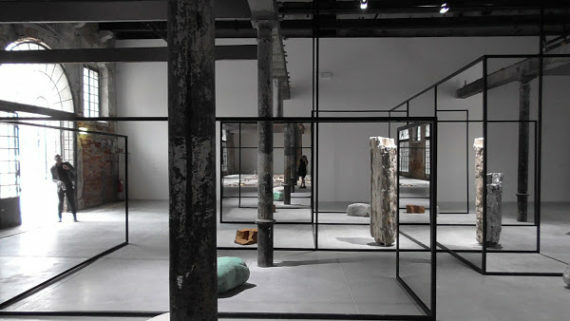 Charrière’s work is described as “poetic archaeology” and indeed it has both a contemporary and a prehistoric feel about it, like the remains of a timeless urban settlement. The ‘humanistic’ approach taken by Marcel seemed to be put into question in the sculpture Do you realize there is a rainbow even if it’s night?, 2017, by Petrit Halilaj, who also received a special mention, of giant moths scattered on the floor and hanging from the walls and ceiling. The link became apparent only when reading about the work which is a biographical narrative that expresses the artist’s highly personal experiences of the Kosovo and Serbian civil war and subjectively translates concepts such as home and identity. It was rather uplifting to discover THE PLAY, an art collective that has been active since 1967, staging art happenings in the Kansai area of Japan. This group of artists regularly renews itself and presently consist of five members. 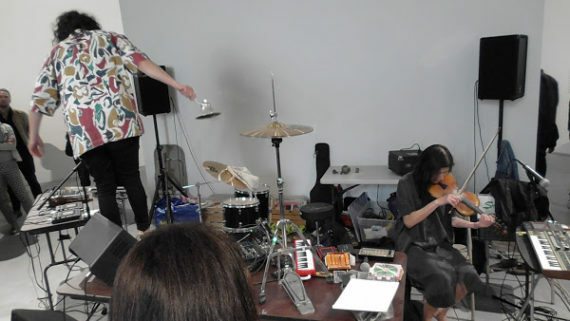 The unique feature of their artistic expression is doing something “without a particular reason”. They carry out interventions or ‘actions’ in natural settings valuing above all the process – the planning and preparation of the performances – and what is actually experienced brings insights into their daily life. Valuing also time and space in the open air, they believe that what is important is ‘playfulness, sincerity and humour, beyond art’s rules’. 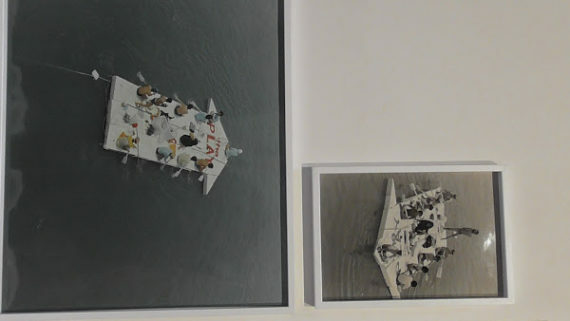 Performances include Current of Contemporary Art, which entailed the piloting of a styrofoam raft floating down the Yodo river on July 20, 1969. The group have now been planning and performing ‘actions’ for almost 50 years. I found this process quite pure and utterly inspiring. 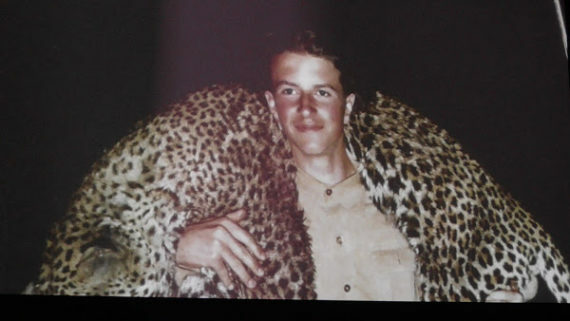 In Les Immobiles by Marie Voignier, 2013, is another favourite, the chilling story of Africa’s glamorous big-game hunting digs deep into the impact of colonial exploitation. I felt the artist’s filming choice to be remarkably powerful: she uses a fixed camera zoomed into the pages of a book of pictures and all you see are the horrifying images of dead animals and the hand of the book’s author who light-heartedly and nostalgically comments while turning the pages. The technique adds to the effect the film seems to be aiming at: there is no escape. As for the animals, the audience and the narrator, in Voignier’s words, “(in her films) faced with a camera without concession, the subjects have no choice but to give themselves, simply, frontally”. The adjacent Pavilion of the Common’s exhibition highlights the resurgence of lost cultures and traditions. 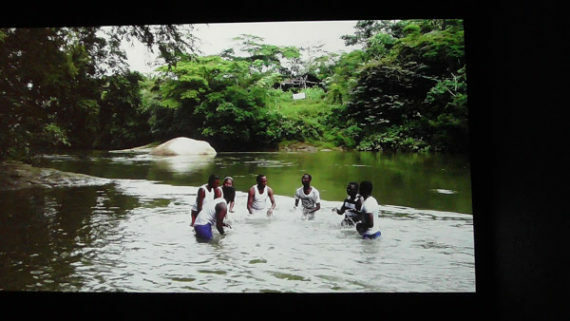 Marcos Ávila Forero’s playful piece Atrato, 2014 is about the forgotten practice of river percussion in the Colombian Amazon. Working with people living along the Atrato River, Avila Forero aims to bring back the Afro-Colombian’s tradition of drumming water to communicate. Using the surface of the Atrato River as a percussion instrument, they physically hit the water in a combined effort. Seeing it after Les Immobiles, this absorbing and charming video, restored my faith in human beings. Another affirmative piece I came across was Alicja Kwade’s sculpture, WeltenLinie (One in a Time), 2017. Playing with the space, the maze of mirrors, the curious objects part of the sculpture – shining rocks, tree trunks, chairs – and the people reflected in it brought out the childlike sense of wonder. The sculpture lends itself beautifully to playful interaction, it was in-fact the artist’s intention to propose a piece that could be “experienced, rather than a solid sculpture”. Finally out of Arsenale, I ventured among the parallel events. I attended an early morning ‘Breakfast Discussion’, The Cost of Free Speech, lead by Sacha Craddock in conversation with Vassiliki Tzanakou, David Birkin and Bernard G Mills. 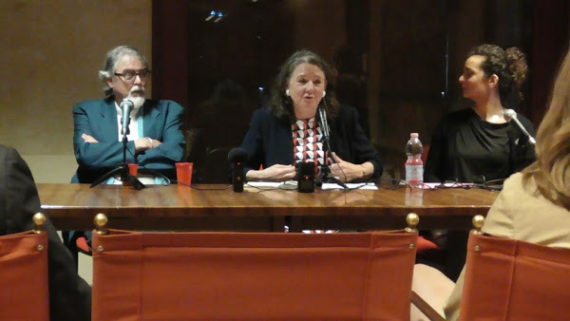 The talk was part of The contract, a series of events presented by The Venice Agenda with contracts “between artist and audience, artist and institution, nation states, and the individual and society at large” as the central topic. Artists and professionals discussed what a contract means to them “in the context of contemporary visual arts and current world events, including Brexit”. This series of debates raised questions into current affairs, the discussion I attended, in particular, questioned the consequences of free speech: alas, with the freedom of speech comes also the freedom to lie. Not too far away, On Kawara’s One Million Years (Reading), 2017, an equally thought provoking installation, although on a completely different level, was quite a discovery. The work is very hypnotic, contemplative, very neat. In contrast with the busy location of Dorsoduro, the venue where the piece is installed, the Oratorio di San Ludovico, is very calm, the installation is simple and minimal in its elements only housing two volumes. The first book, Past, is dedicated to “all those who have lived and died”, and covers the years from 998,031 BC to 1969 AD. The second book, Future, is dedicated to “the last one”, and begins with the year 1993 AD and ends with the year 1,001,992 AD. Two sets of volunteers read from the books for an h at a time. Kawara explores how we use dates to comprehend something so difficult to express such as ‘time’. Absorbed by the reading it was as though I had been transported into a trance and I felt a strong urge to cry. But the Diaspora Pavilion opening night at stunning Palazzo Pisani S. Marina, brought me back to my full senses! It was undoubtedly an exhilarating night out. 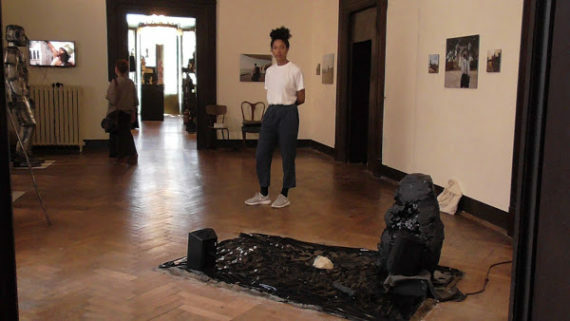 Organised by International Curators Forum and University of the Arts London (UAL), the exhibition is curated by David A. Bailey and Jessica Taylor. 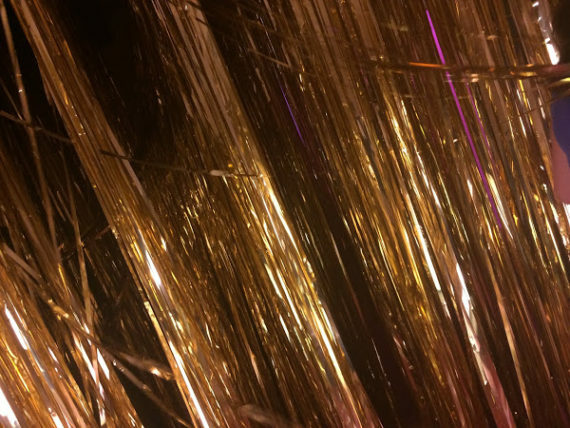 From the moment you enter the Palazzo you are transported to a different dimension, having to walk through a ‘wall’ of shimmering gold to the sound of Golden lady as well as Golddigger among many songs: not the whole songs, but samples containing the word ‘gold’. It is part of Susan Pui San Lok, Untitled (Pavilion), 2017 and Songs I – VI, 2005-2017, that together form an installation right on the front door of the palazzo. Walking through it, you are filled with expectation and then finding yourself in a room full of boats suspended in the air, immediately gives you a sense of something ‘special’ and ‘magical’. All the work here is exceptional, each piece for different reasons, from the meticulous and beautifully executed wall drawing by Barbara Walker to the intelligent and playful work by Libita Clayton. Appropriately described by International Curators Forum, this exhibition “expands, complicates and even destabilises diaspora as term, whilst highlighting the continued relevance that diaspora as a lived reality holds today”. The extended project ‘Diaspora Platform’, also deserves particular attention. It delivers mentoring and professional development to UK-based emerging artists engaging with the concerns of the diaspora. The programme was most interesting to me as supporting young talent is at the core of all 51zero activities. I set off to explore this year’s exhibition with one objective in mind and a hope. I certainly saw a considerable amount of work which has undoubtedly affected me. 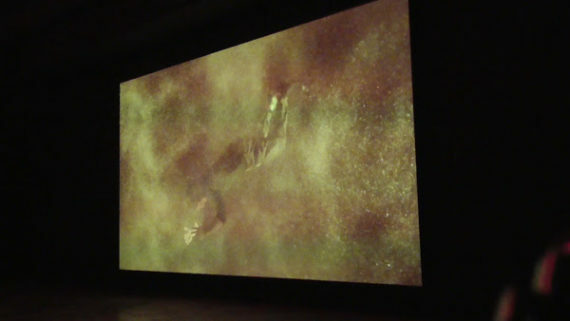 In particular, THE PLAY’s artistic approach was most stimulating and Taus Makhacheva’s Tightrope, Charles Atlas’s The Tyranny of Consciousness, and On Kawara’s One Million Years (Reading) have a quality that distinguishes them from other work and did bring a pronounced response from me. Indeed I was inspired. With regard to my experience as a visitor, to both Venice and the Biennale, I would like to conclude by making a few points. I certainly treasure having met interesting colleagues, potential collaborators and I also learned strategies which I would happily transfer to 51zero festival. In particular, a revisitation of Tavola Aperta could be a very effective tool to encourage the audience to participate in art dialogues. For a contained size festival like 51zero attracting audiences, especially local ones, is paramount. A lot of effort is put into addressing participation and audience experience, also because of the considerable pressure which projects of this type are under to ensure diversity and community involvement, in order to gain support from funders. Events on the scale of the biennale can be quite daunting for a general visitor as well as a seasoned professional and do have repercussions for local people, which have been a common complaint here in Venice and recently in Athens during Documenta. Backed up by comments from regular folks as well as my family from Murano, I could not escape noticing how this event impacts on the locals. 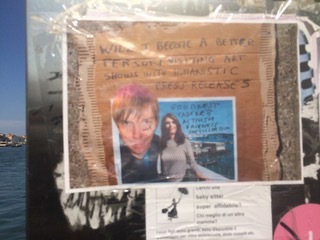 It is true that localised heartfelt comments alone do not amount to a fully fledged argument and set of facts, however, they do raise under researched effects the Biennale has on the population and how poorly and inadequately these issues and concerns have to date been addressed. If this is true, then the proclaimed humanistic intentions of the curator, and the cementing socio political role the art institutions want from art, seems to break down in the context of the local audiences, which contradict in my opinion the implied aim to educate and bring the benefit of art to a broader population, especially non art audiences. I feel that with regard to audience experience, the value of projects the scale and ambition both artistic and social of 51zero, play a pivotal role in bridging that gap.